However this code prints 8 not Infinity or some other string constant like PositiveInfinity. Why does this infinity print 8? Be assured that the floating point value is +Infinity if the numerator of a floating point division by zero is positive, -Infinity if the numerator of a floating point division by zero is negative, and NaN if the numerator and denominator of a floating point division are both zero. That's in the IEEE754 floating point specification, which is what C# uses. In your case, the console is converting the infinity symbol (which is sometimes represented typographically as a horizontal 8 — ∞) to a vertical 8. Given certain settings (i.e. combination of cultures, output encoding, etc.) .NET will output the Unicode infinity character ∞ (∞ / &#8734;). 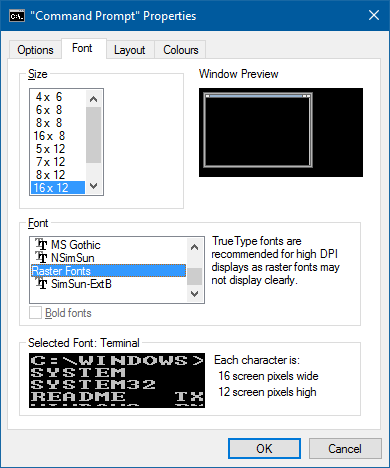 The Windows 10 console/terminal emulator will (again given certain settings - see screenshot below) display this Unicode character as an 8. 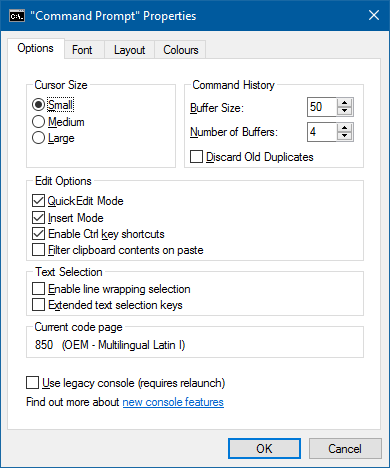 For example, on Windows 10, with the below settings (note the code page) simply pasting ∞ into the console shows as 8. With thanks to comment from Chris: It seems that the output font in combination with the code page is responsible for the ∞ => 8 issue on the console. Like him I get proper display of ∞ in all the TrueType fonts I have tried and only see 8 when raster fonts' is chosen. The 8 symbol occurs when Windows converts Unicode to a legacy character encoding. Since there is no infinity symbol in the legacy encoding, it uses a "best fit" to that symbol, by default, which in this case is the number 8. See an example for Microsoft's "windows-1252" encoding. Apparently, Windows 10 still uses legacy character encodings by default in the console (see "Code Pages"). Note: The implicit .ToString() method call when writing Double.PositiveInfinity to console is responsible for this behavior. results in the string "Infinity"
while Console.WriteLine(Double.PositiveInfinity.ToString(new CultureInfo("fr-Fr"))); results in "+Infini". Edit: As others have pointed out in the commets, they cannot entirely confirm my results. Testing this on a different machine, I get the character ∞ for both calls. Output for all cultures, thanks to vtortola in the comments. Using Console.OutputEncoding = Encoding.Unicode; I can recreate the behavior you are experiencing for several cultures, e.g. "ru", "ru-RU" produce the output 8. Code page 1252 is a pretty common accident in England since it is the default Windows code page there. As it is for Western Europe and the Americas. Lots of reasons to change the default Console.OutputEncoding property programmatically, many text files will be encoded in 1252. Or from the command line by typing chcp 1252 (chcp == change code page) before starting the program. As you can tell from the character set supported by 1252, the Infinity symbol is not available. So the Encoding has to come up with a substitute. That is often the ? glyph for unsupported Unicode codepoints, the Encoding.EncoderFallback property value for 8-bit encodings. But for 1252, and the legacy MS-Dos 850 and 858 code pages, the Microsoft programmer decided for 8. Funny guy. The glyph is supported in the usual code page for console apps on a Western machine. Which is 437, matches the legacy IBM character set. Having these kind of encoding disasters is why Unicode was invented. Sadly too late to rescue console apps, far too much code around that relied on the default MS-Dos code page. "8" for infinity is displayed in the console when running .Net 4 and above, otherwise previous versions display "Infinity". Using Console.OutputEncoding = Encoding.Unicode; in .Net 4 and above will get infinity to display as ∞, but throws an IOException in previous versions. Not the answer you're looking for? Browse other questions tagged c# .net windows or ask your own question. Why do decimals give a compile time error on division by zero?